Got it, brand new, perfect. Thank you so much for your help! I wish I had more to find, it’s been really fun! 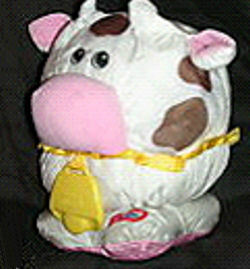 I am looking for a Little Tykes Puffalump style cow. There were 3 animals in this collection (1993), this cow, a lamb and a pig. My little girl who is 13 has slept with them since she was a baby, but her favorite was the cow and it doesn’t look like a cow anymore. These plushes were not really washing proof and got really pale through the years. I bought the pig from you, and found the lamb on Ebay for 6$. The cow is actually on Ebay, but for $50, which is a ridiculous price. So I was wondering if you could find it. it did work, thank you! strangely, it didn't appear on my computer but it did from another. I got it for 17$.